Arrived home from a week at the lake to discover complete devastation of the tomatoes. Not really sure what kind of varmint we’re dealing with but a varmint for sure. Half-eaten tomatoes strewn around the back yard, both beautifully ripe and green. 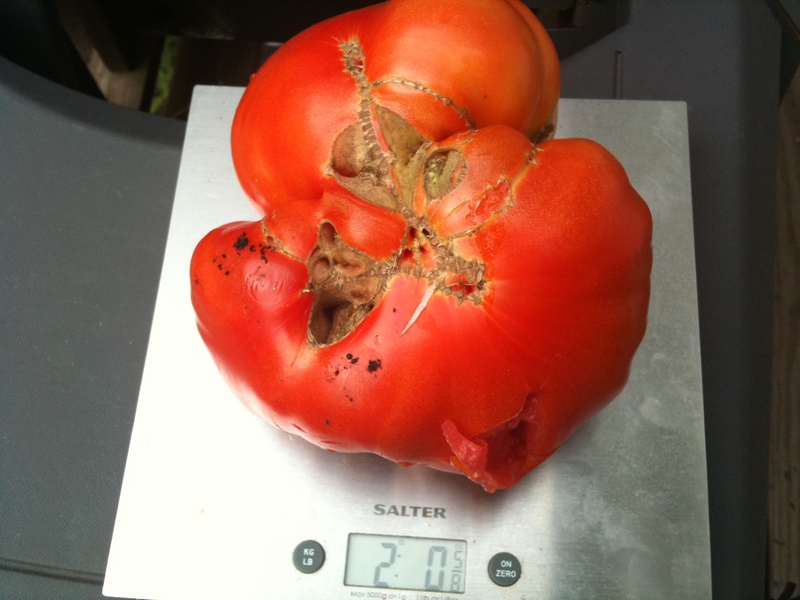 I guess the varmint ran out of ripe tomatoes mid-week. This tomato was the only one left undamaged and close to ripe. But it needed at least another day (and probably two) so I left it on the vine. Came out this morning to find one tiny bite taken out of it. Curses! Foiled! And so far it’s the heavyweight winner, even with a we bit removed. 2 lbs. 5/8 ounces. You need Wil E. Coyote to drop an Acme anvil on that varmint.